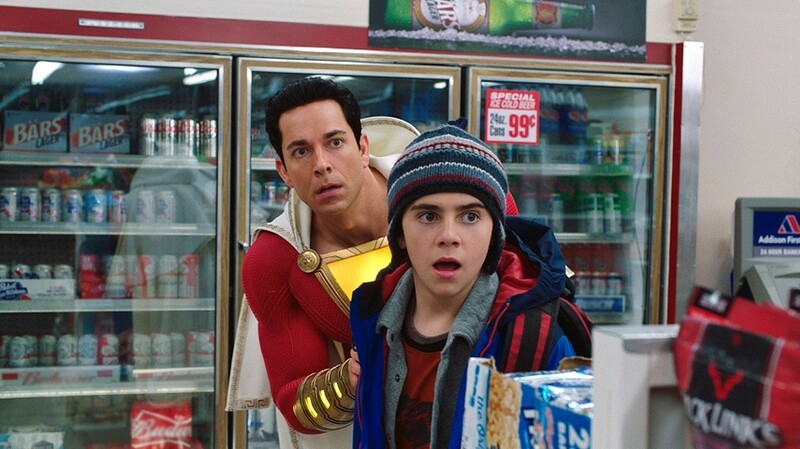 PHOTO COURTESY WARNER BROS Zachary Levi and Jack Dylan Grazer in "Shazam!" The DC Comics big screen universe continues its upward trajectory with the immensely charming "Shazam!," a superhero origin story that gets an appealing bolt of energy thanks to director David F. Sandberg's ability to combine humor, heart, and spectacle into a narrative that should satisfy audiences, no matter what they're looking for. We meet Billy Batson (Asher Angel), a wayward teen who's spent his childhood bouncing between foster homes. Not one to get too attached, he runs off before he has a chance to get settled. At 4 years old, he was accidentally separated from his mother at a carnival and never found her again, but he's sure that she's still out there looking for him. Billy's latest placement is in the home of loving couple Rosa and Victor Vasquez (Marta Milans and Cooper Andrews) and their other five foster kids: Freddy (Jack Dylan Grazer), a disabled superhero enthusiast; video game obsessed Eugene (Ian Chen); Darla (Faithe Herman), the adorable youngest; college-bound Mary (Grace Fulton), and Pedro (Jovan Armand). They're eager to make him part of the family, but Billy has his eyes on the door. Then one day Billy's magically whisked to the realm of the wizard Shazam (DjimonHounsou). The last of his kind, Shazam is tasked with protecting the world from the Seven Deadly Sins, which take the form of a collection of alarming gargoyles; demons that wish to break free and wreak havoc on the world. The wizard must locate a worthy successor, an individual who can carry on his legacy, and to whom he can bequeath his mystical powers. It seems that Billy is just that pure-hearted soul. By shouting the magic word "Shazam!," he can transform into a strapping superhero (now played by star Zachary Levi) with abilities drawn from his ancient immortal elders: the wisdom of Solomon; the strength of Hercules; the stamina of Atlas; the power of Zeus; the courage of Achilles; and the speed of Mercury. In short, everything Billy needs to save the world. At first he isn't sure what to do with these gifts, and the film has a lot of fun watching the Superman-obsessed Freddy help Billy test the limits of his powers (and share it with an ever-growing audience through social media), geeking out over each newly discovered ability. This section is as good as I've seen in any comic adaptation at tapping into the wish fulfillment fantasy of its stories. To most kids (and a fair amount of us adults), being a superhero would pretty much rule. But of course there's also a supervillain to contend with. Dr. Thaddeus Sivana (Mark Strong, having fun chewing the scenery with a somewhat one-note character) was one of the many Shazam deemed unworthy, and over the years his resentment and rage curdled into an obsession with gaining the power he feels he's rightfully due. With Sivana, the film offers a cautionary tale of what happens when those who lust for power actually get it. The plot sets him in stark contrast to Billy, who must figure out what's truly important to him and choose how to wield the immense gifts he's been given. Angel handles the more emotionally fraught side of young Billy with impressive skill, and Levi digs into the part with an enthusiasm that makes it easy to believe there's a kid underneath all those rippling muscles, one who hasn't quite gotten the hang of his new adult-sized body. The scene-stealing Grazer is great, developing a nice rapport with both Billy the...er, kid, as well as Billy the superhero. Like "Aquaman" before it, "Shazam!" embraces the inherent goofiness of its premise, and it's all the better for it. But while it maintains a generally lighter tone overall than we've come to expect from DC's movies, the film has its share of dark moments. Director David F. Sandberg (previously helming "Lights Out" and "Annabelle: Creation") draws on his background in horror, especially in scenes centered on the Seven Deadly Sins. The demons have a pleasingly Harryhausen-esque stop-motion feel to them, but they lend themselves to some horrific imagery that may be too intense for younger viewers. Sandberg juggles tone to great effect, weaving together an effervescent sense of humor, satisfyingly emotional moments and exciting, character-driven action. His film is as much a coming-of-age narrative and heartfelt family drama as it is a superhero origin story. Like a lot of big action flicks released these days, "Shazam!" shows the influence of Amblin-style 80's family-adventures. It's a delightful cross between "The Goonies" and a superhero version of "Big," and Sandberg succeeds at capturing the wonder (and occasionally fear) of being a human in a world in which super-powered gods walk among us. Movie Previews Film Film preview "Shazam!"